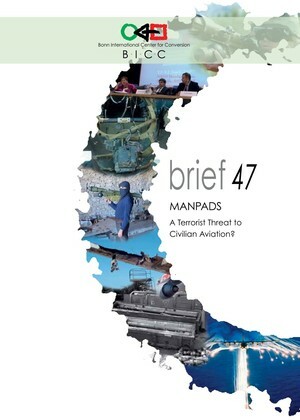 BICC brief 47 is dedicated to the issue of Man-portable Air Defense Systems (MANPADS). The authors Dr. Michael Ashkenazi, Princess Amuzu, Jan Grebe, Christof Kögler and Marc Kösling provide a comprehensive survey of all aspects of MANPADS as a challenge to managing civilian security. The publication is based on a research project supported by the German Foreign Office. Close upon their first deployment in the late 1960s, Man-portable Air Defense Systems (MANPADS) became attractive weapons for non-state armed groups to defend themselves against aircraft in asymmetric conflicts, and as a terror weapon against civilian aircraft. Today, MANPADS are found in the arsenals of around 100 states. Make recommendations of how to limit the threat of MANPADS to civilian aviation. While BICC brief 47 discusses military data and related issues to some extent, it must be noted that the focus of this publication is on civilian MANPADS issues, not the military aspects of their use or deployment. It therefore summarizes the issue of MANPADS for political decision-makers concentrating on the potential effects of MANPADS on civilian aviation.